Demanding Realization of Small-size Classes, and Increasing Budgets for Education by "Nationwide Signature Campaign for Education"
Aiming Elimination Nuclear Weapons, Peace and Democracy with Protecting the Constitution of Japan. Prime Minister Shinzo Abe state, “The existence of the Self-Defense Forces should be clearly defined in Article 9 of the Constitution.” and he tries to make Japan “war capable nation”. Under the slogan of “Do not send children to a battlefield again”, Zenkyo campaigns to defend article 9 with full force. Zenkyo Members actively participated in more than 200 nationwide actions such as constitutional rallies, marches, and a publicity campaign. Prime Minister Shinzo Abe holds firm to revision of the article 9 to making Japan “war capable nation”, and will destroy the constitutional principle of peace. All-national campaign intensified its campaign against revision of the article 9 since last year. By the end of April, 30million-signature campaign calling to protect the Constitution reached 13.5 million. Zenkyo is also actively conducting this campaign. We set the February 20th to March 30th and, the April 13th to the May 13th, and concentrated on that period collecting signatures actively. Our members have expanded this while doing various publicity such as constitutional cafés, signatures on the streets, votes and so on. On May 3, rallies and marches to protect the Constitution were held at more than 200 nationwide. 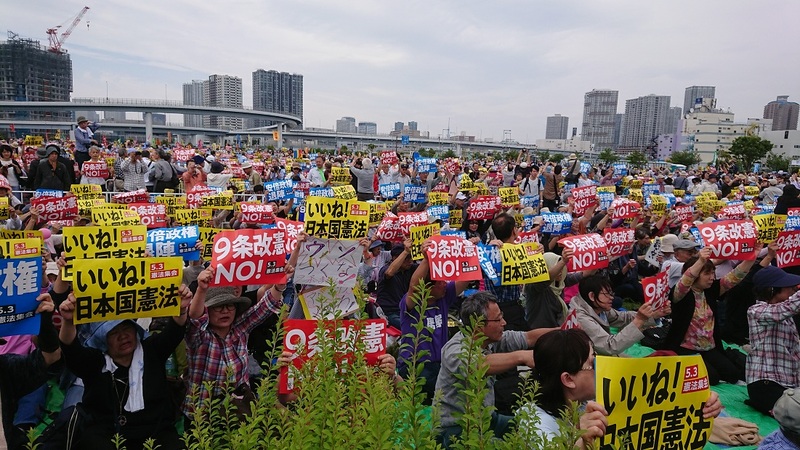 Various actions from Hokkaido to Okinawa took place, and many citizens showed a strong will to “No to Article 9 revision!” and “Resign, Abe Cabinet!” At the Tokyo Rinkai Disaster Prevention Park "No to Article 9 revision! Peace and Life and Human Rights! May 3 Constitution rally" was held, and 60,000 people gathered. Zenkyo members also gathered 360 people from all over the country. We prohibit the reproduction of contents. Copyright(c)ZENKYO. All rights reserved.